Application of Cooperative Learning Methods Numbered Heads Together (NHT) to review the findings improve learning and Critical Thinking Students in socialstudies in elementary school. This study is a class action label study. The collected datais the data Students learn critical thinking commercial article. Data collection is done byobservation, testing, documentation and questionnaires. Husband research consistsFrom prayer cycle. Cooperative Learning Research Results Numbered Heads Together(NHT) showed an increase in critical thinking skills students learn the commercialarticle. Process improvement study findings known that i cycle on pre-test activitiesamounted to 6.25% 65.63% on increased Being a post test activities but still meetrequirements yet classical completeness The school set. Taxable income Researchers Repair on the cycle II pre-test activities known that classical learning completenessamounted 15.63% 93.75% on increased Being Postal test activities and has beenfulfilling requirements set classical completeness The school that is ≥ 75% by begitu Has Occurred increase mastery learning Grade V amounted to 28.12% Based on thesefindings can Execution Model that concluded the implementation of Cooperative Learning Methods Numbered Heads Together (NHT) can Critical Thinking skill simprove student learning commercial article. Arikunto, Suharsimi. 2009. Dasar-Dasar Evaluasi Pendidikan. Jakarta: PT Bumi Aksara. Budiningsih, C. Asri. 2005. Belajar dan Pembelajaran, Yogyakarta: Rineka Cipta. Opini-Perbaikan Mutu Pendidikan Di Indonesia: Betulkah Begini Caranya.html), diakses tanggal 14 Desember 2012. Kunandar. 2011. Guru Profesional Implementasi Kurikulum Tingkat Satuan Pendidikan (KTSP) dan Sukses dalam Sertifikasi Guru. Jakarta: Rajawali Pers. Mulyasa. 2007. Kurikulum Tingkat Satuan Pendidikan. Bandung: Remaja Rosda Karya. PERMANA, Erwin Putera. Penerapan Metode Pembelajaran Kooperatif Numbered Heads Together (NHT) Untuk Meningkatkan Hasil Belajar dan Berpikir Kritis Siswa Pada Mata Pelajaran IPS SD. JURNAL PENDIDIKAN DASAR NUSANTARA, [S.l. ], v. 1, n. 2, jan. 2016. ISSN 2579-6461. 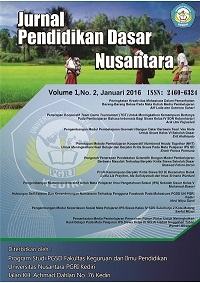 Available at: <http://ojs.unpkediri.ac.id/index.php/pgsd/article/view/210>. Date accessed: 25 apr. 2019. doi: https://doi.org/10.29407/jpdn.v1i2.210.